22-Jan-2018 -- This is the 1st out of 2 reports reaching new confluence points during our one-week trip through the Maldives archipelago. The itinerary and additional pictures can be found here. Our trip – as nearly all trips to the Maldives – started from the airport Island Hulhule (65 km east of this confluence point). On our way by speedboat to Ellaidhoo Island in the Northern Ari Atoll (Alifu Alifu Atoll), we missed this confluence by 2.55 km. I hadn’t been able to convince the captain to make a “little” deviation to this confluence point. At a speed of 63 km/h every second delay is harmful. However, while spending two days on the tourist island Ellaidhoo in only 5.6 km distance from the confluence, I was able to charter a traditional Dhoni ship that would bring us to the confluence point. The sea was calm and at a speed around 13 km/h it took us half an hour to reach our destination. We missed the confluence by 16 m, but we hadn’t been quick enough to get a picture of the display. We u-turned and this time I got a 21 m distance picture. 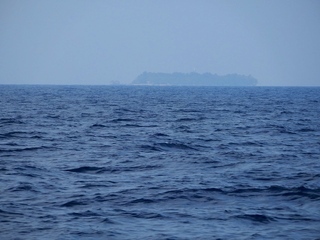 From the confluence, two islands can be seen: Ellaidhoo to the West and Maaga to the South-West. The little island Maaga is the nearest island with a distance of 4.8 km. After the visit, we spent most of the day on Maaga. The island is inhabited by two people only: Abdulla and Ahmed as well as the pelican Aisha. Abdulla, the owner of the island is planning to make this island a luxury tourist resort. They cooked for us freshly caught calamari and showed us around. It was a really enjoyable day with them! In the afternoon, the crew of our Dhoni ship requested to get back. So we left beautiful Maaga and returned to Ellaidhoo. The story continues at 7°N 73°E. In the sea about 5 km from the nearest islands with a good view of land.